Potholder There are 2 products. 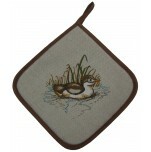 Potholder ecru with duckling printed, 51% linen 49% cotton, 17x17 cm, brown contour and pendoir. Printing duckling 2 sides. 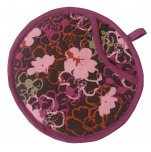 Round Potholder, 20 cm diameter, 100% cotton quilted with 100% polyester inside, brown background with purple outlines; Flower colors: brown, pink, green and purple.